Dance Movement Therapy (Dmt) is a helping profession aimed to a global reorganization (functional, social and psychological) by means of body creative interactions. Dmt develops the traditional therapeutic and social function of dance. It is a precious tool for rehabilitation of many kinds of disability, as well as a source of community aggregation. 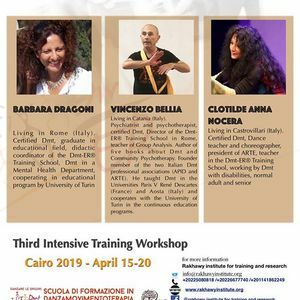 This is the third intensive training workshop in Dmt-ER® organizaed in Egypt by the Rakhawy Institute in partnership with the Dmt-ER® Training School. The workshop includes a basic introduction to Dmt-ER® methodology and a focus on a developmental approach and application. The workshop should is acknowledged within the three years training program requested to obtain the Dmt-ER® diploma. 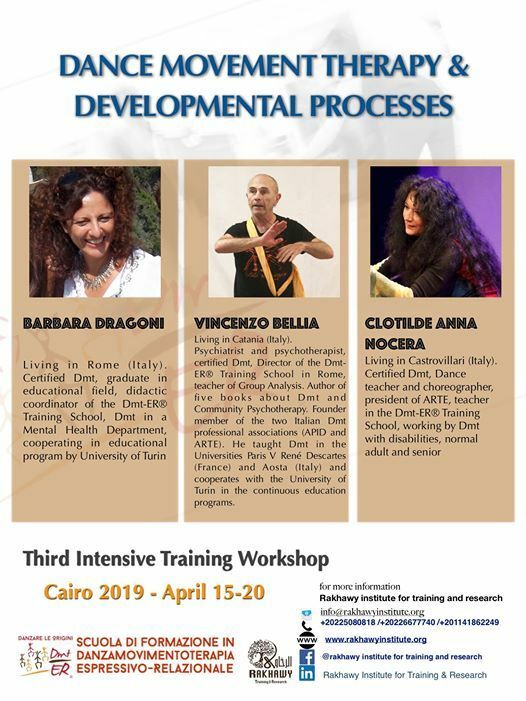 Psychiatrist and psychotherapist, certified Dmt, Director of the Dmt-ER® Training School in Rome, teacher of Group Analysis. Author of five books about Dmt and Community Psychotherapy. Founder member of the two Italian Dmt professional associations (APID and ARTE). He taught Dmt in the Universities Paris V René Descartes (France) and Aosta (Italy) and cooperates with the University of Turin in the continuous education programs. Certified Dmt, Dance teacher and choreographer, president of ARTE, teacher in the Dmt-ER® Training School, working by Dmt with disabilities, normal adult and senior. For any information about dance movement therapy, please visit the website of American dance therapy association.